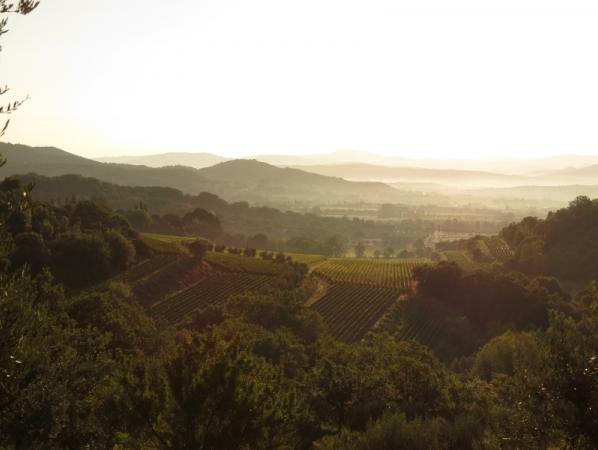 "Tucked away in the hills of Suvereto near Bolgheri on the Tuscan Coast – one of the hottest areas in Tuscany – is the 15-acre Montepeloso estate. The winemaker, Swiss-born Fabio Chiarelotto, admits about his wine that it's "easy produce concentrated wines in such a hot climate...but it's much harder to achieve elegance and finesse." In order to take full advantage of the terroir's potential, he overhauled the vineyards in 1997 – retraining, pruning, and even regrafting many vines. In the cellar, he does relatively short macerations, employs natural yeasts during fermentation, and bottles without filtration. Nardo (Tuscan dialect for lavender), remains Montepelosos' flagship wine. It is an unfiltered blend of approximately 70% Sangiovese, 20% Montepulciano, and 10% Cabernet Sauvignon, and never made in a quantity of more than 400 cases a year. Beginning in 1997, there is a second luxury cuvée, made in even smaller quantities--Gabbro, 100% Cabernet Sauvignon from 35 year-old years. Approximately 120 cases are produced. The estate's basic Rosso was renamed Eneo for the 2000 vintage. This wine has emerged as something special in its own right since Chiarelotto's arrival, and the new name celebrates that fact. It remains primarily Sangiovese, with Colorino and Merlot, and is aged in 2nd and 3rd year French barrique. It remains a pure and powerful, yet elegant example from this heralded zone of Tuscany. Production will gradually increase as the young vineyards reach maturity. For now, these remain among Italy's elite rarities." James Suckling 92"Plenty of ripe fruit for a cool vintage with fresh mint and thyme undertones to the citrus and berry character. Medium body, firm and silky tannins and a flavorful finish. Focused and pretty."